THE L.A.-BASED LABEL OFFERS SIMPLE AND SOPHISTICATED PIECES, RANGING FROM SUIT SEPARATES TO OVERSIZED SWEATERS AND BLOUSES. THE BRAND WAS FOUNDED BY KOREAN-AMERICAN DESIGNER, MIJEONG PARK IN 2015. WITH ITS CALIFORNIA-INSPIRED AESTHETIC, CLEAN TAILORING, AND NEUTRAL COLOR PALETTE, ALL OF ITS ITEMS EASILY CAN BE STYLED FOR ALMOST ANY OCCASION – PERFECTLY SUITED TO BE EITHER WORKDAY OR WEEKEND ATTIRE. THE TIMELESSNESS OF GARMENTS WILL MAKE THEM MAINSTAYS IN YOUR WARDROBE SEASON AFTER SEASON. “OUTERWEAR IN SLICK PLAID (AT FENDI), IN BOLDLY SUPERSIZE SHAPES (AT BALENCIAGA) AND IN PUFFY LEATHER (AT PRADA) PROVIDED THE BIG, FAT EXCLAMATION POINTS AT THE END OF EACH LABEL’S FALL 2018 STATEMENT ON THE RUNWAY. BIGGER WAS BETTER, LOUDER WAS LOUDER, AND MORE WAS CERTAINLY MORE… EVEN THE TRENCH, THAT PARAGON OF CLASSIC STYLE, GOT PUMPED UP THIS SEASON. THE BEST WAY TO WEAR ONE NOW, IT SEEMS, IS TO BE SWIMMING IN IT. SIZING UP NOT ONLY IMBUES AN ENSEMBLE WITH A CERTAIN BORROWED-FROM-THE-BOYS COOL, BUT ALSO PROVIDES EXTRA ROOM TO PILE ON THE LAYERS”. 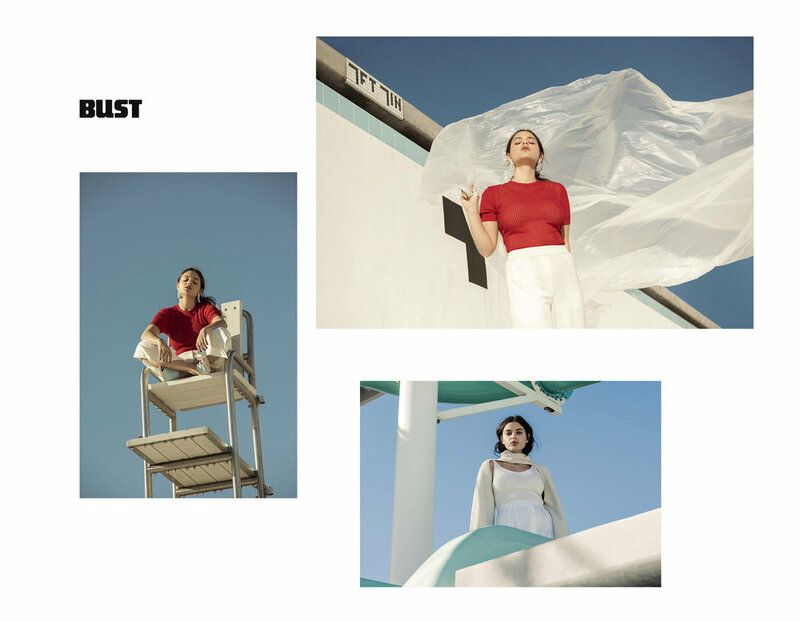 "ISRAELI-BORN ACRESS AND MODEL, ODEYA RUSH OF DEAR DICTATOR AND THE GIVER STARS IN LOS ANGELES-BASED FASHION AND PORTRAIT PHOTOGRAPHER MOLLY CRANNA'S DREAMY END-OF-SUMMER POOLSIDE PHOTOSHOOT". "THIS PARTICULAR OUTFIT REVOLVED AROUND ONE OF MY ALL-TIME FAVORITE PURCHASES THIS SEASON, MY ORANGE TRENCH COAT FROM MIJEONG PARK (FORMERLY ACHRO). THOUGH I TEND TO STICK WITH MONOCHROME EARTHLY-TONE SHADES, I KNEW THIS ORANGE COAT WAS A STATEMENT PIECE THAT'LL LAST A LIFETIME (MAY EVEN GIFT IT TO MY FUTURE CHILDREN ONE DAY, MAYBE!)". 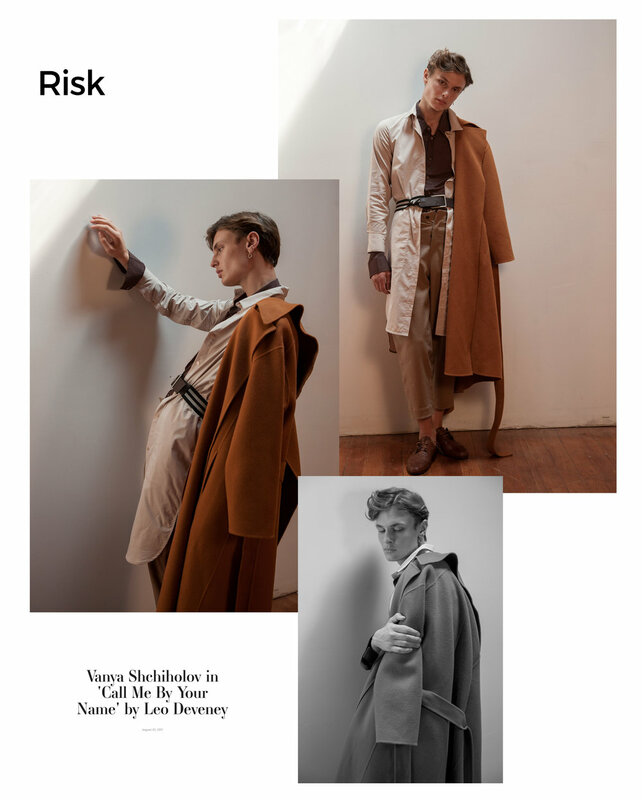 IN A RISK MAGAZINE ONLINE EXCLUSIVE, VANYA SHCHIHOLOV IN STARS 'CALL ME BY YOUR NAME' PHOTOGRAPHED BY LEO DEVENEY. WEARING PIECES FROM GUCCI, JIL SANDER, ALEXANDER MCQUEEN, YSL, PRADA, HERMÈS, RAF SIMONS, RACHEL COMEY, OLIVER PEOPLES FOR THE ROW, ACHRO, CHRISTIAN LOUBOUTIN, CALVIN KLEIN, CÉLINE, CARHARTT, & LEVI'S.